Deal Pier features in my novel, Deadliest Deal, as the venue of a gruesome murder, but the pier as seen now is the third to be constructed on that site or close by. The first was built in 1838 and destroyed by storms in 1857. The second, completed in 1864, was considerably longer and became quite an attraction in Victorian Society due to its elegant construction, decked promenade, three-tiered steamer landing stage, luggage tramway to serve the steamers and, following repairs subsequent to damage caused by shipping and storms, the addition of a reading room and salt baths. 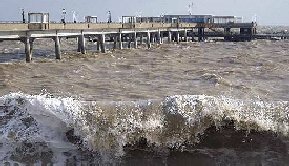 1940 saw the destruction of that pier when a Dutch ship, damaged by a mine was first beached to save her from sinking but was then lifted clear of the beach by the rising tide and heavy seas thrust her repeatedly into the pier’s superstructure destroying it beyond any possibility of repair. 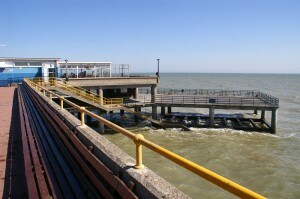 The Duke of Edinburgh opened the third and current pier in 1957, 100 years after the first was destroyed by a storm. Coincidentally, I was a 10-year-old schoolboy attending the Methodist School at the time and along with the rest of the school I watched the opening ceremony. Many times in the subsequent six years I braved cold, wind and rain to fish all night from the pier head; I once caught a magnificent 6½ pound Cod. I should have been elated, but being so cold I couldn’t feel my fingers, or any other part of my body for that matter, two gentleman fishing close by informed me there was a fish on my line and landed it for me in a landing net because I was unable to grip and turn the handle of my reel. An exciting event for a 12 year old was turned into a non-event due to the weather. 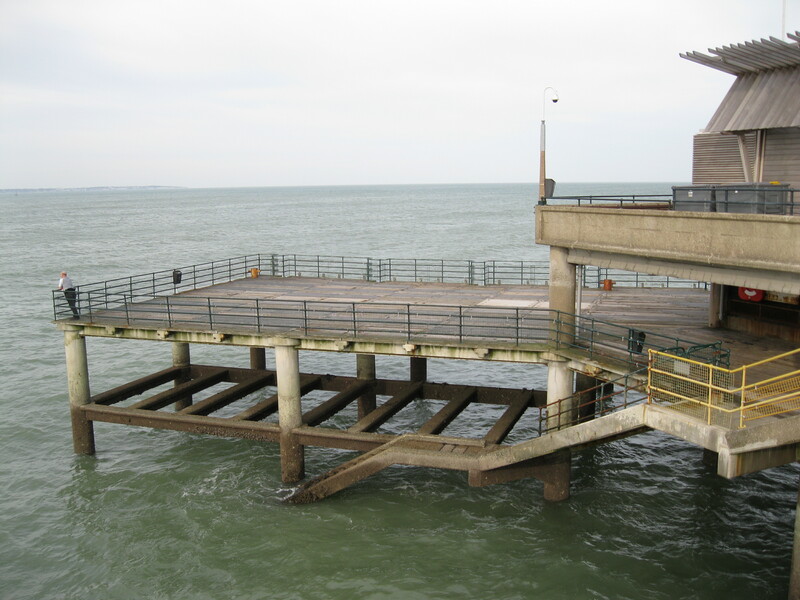 Bad weather is an important issue for all piers; Deal is no different from any other except in respect of the lower of three decks at the pier head, which no longer has any decking. 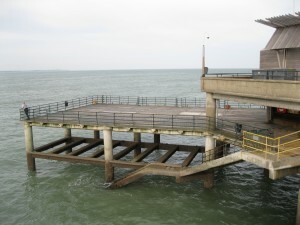 When the pier was designed, in the shape of a letter ‘T’, the pier head was the crossbar of the ‘T’, and had two timber fishing decks below the level of the main concrete promenade; the lower decks were accessed by concrete steps on both sides, but the lower deck was submerged by every high tide, twice a day, with the result it has never been open to the public and now due to storms, to which Deal is no stranger, there’s not a single piece of timber left on the lower deck (see photographs below). Recently an innovative piece of artwork has been incorporated into the pier’s lighting system, which causes the lights to flicker in response to lightning flashes around the globe. Lightning expert, Dr Martin Fullekrug, teamed up with artist Katie Paterson to create the system called Streetlight Storm. 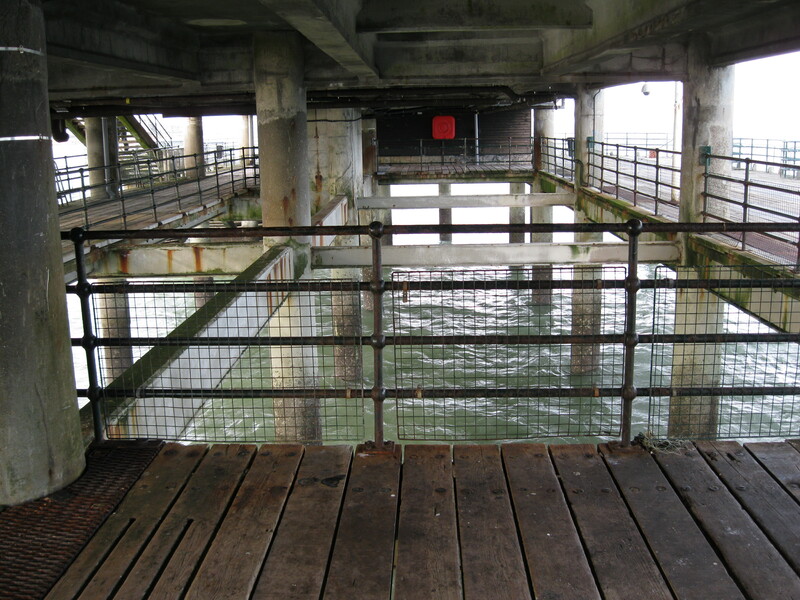 At the centre of the pier head, below the award winning architecture of the restaurant, is a void, a rectangle enclosed by steel railings and with no decking, its known to fishermen as ‘the well'; find its gruesome secret in Deadliest Deal.